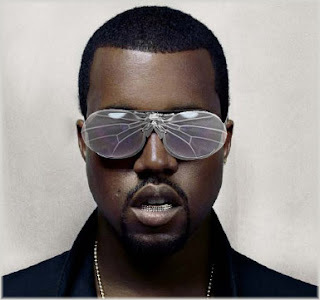 No, I won't be going through the 50 different pairs of Sunglasses that Kanye might have. ::Shutter shades in EVERY color:: I actually want to highlight some new looks for fall that I fancy or have fancied before and they are coming back! You see these pants? I would totally rock them, IN FACT I have rocked them! I own a similar pair that I got in Spain circa 3 years ago. I'm not sure if Boston is ready for them, but I plan on bringing them back out this fall season. This style is actually from Karmaloop.com's new female counterpart Miss KL, so I have them to thank for bringing back some much needed attention to my B/W striped pants currently in my closet! Above you see some new Nike: Zoom Rookie Galaxy Glow in the Dark Shoes + Laces... and you also see my affinity for a life in Tron or Metroid. Yep, these sneaks are HOT and glow in the dark. More things should be glow in the dark, just saying. Finally, because color blocking doesn't seem to be a dying trend and solid colored slacks have hit the masses this summer in full force, I think the only way to go from there is chameleon. What I mean is adapt. Adapt your pants into the Fall, like the example above. You can totally make it work through to Fall. (Yeah, and if you are wondering- I did have a red and a green pair of pants also influenced by my time in Spain. That or I am just that ahead of the game =D). Sheer shirts are gaining steam still, but be sure to wear them... with fashionable taste. It's not always about the skin showed-- it's about rocking the style and bringing the style to life with your own personality.